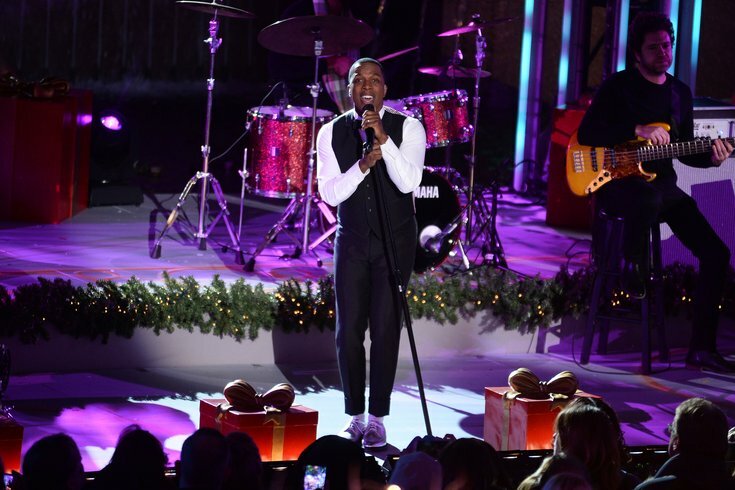 Singer Leslie Odom Jr. performs at the 85th Annual Rockefeller Christmas tree lighting ceremony in New York, NY, on November 29, 2017. The Philadelphia Eagles have secured another week of hope (and anxiety) for fans hoping to see the team make it to the Super Bowl, but we at least know Philly will be represented when it comes to a couple musical performances come Feb. 4 in Minneapolis. Pink has already been announced with the honor of singing the National Anthem, and now Leslie Odom, Jr., who originated the role of Aaron Burr in “Hamilton” and now comforts us with his own original albums and the Nationwide jingle, will be performing “America the Beautiful” at the game. This is a continuation of a little “Hamilton”-Super Bowl tradition, it seems, as last year three other members of the original cast -- Jasmine Cephas Jones, Renee Elise Goldsberry, and Phillipa Soo -- performed “America the Beautiful” last year. Odom was one of “Hamilton’s” biggest breakout stars, scoring him a 2016 Tony Award. Last year he starred in “Murder on the Orient Express” and performed tunes off his “Simply Christmas” holiday album at Rockefeller Center. If you’re not familiar with him or his voice, here’s a few clips to get you amped for his performance -- and ease the tension as we wait to see if the Eagles will be joining him in Minneapolis. And a 30-second song that will make you seriously consider purchasing Nationwide Insurance.